We think that connecting with nature, growing food and low impact living are essential skills for children to learn as they grow into the adults who will inherit our planet. Our first activity as a group was apple pressing with locally picked fruit at Brookfield parents evening in October, and we welcome children at all of our events and meetings. We hope to connect with all of the schools and nurseries in Dartmouth Park, but started with Brookfield as many of us currently involved in our Transition Initiative have children there. We’d really like to inspire parents with children at any of the secondary schools or nurseries in the area to intiatiate events and activites in these, and are happy to help and advise. 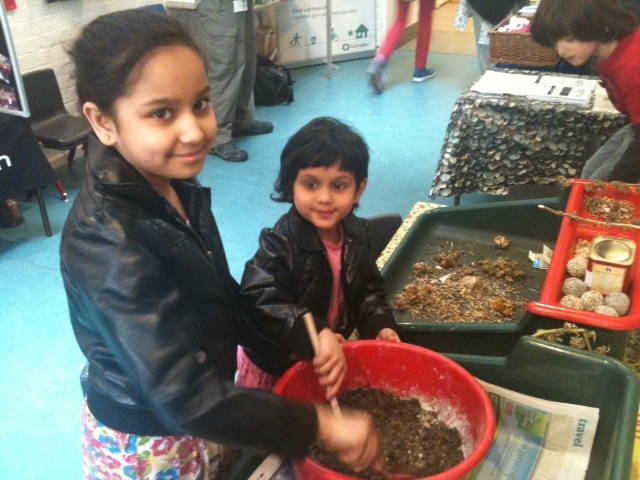 In 2012 we worked with Brookfield Primary School to organise several activities for the children, including apple and pear pressing in the playground using locally picked fruit,; an assembly on waste and recycling featuring a ‘Man Can’; wildflower seed bomb making at the school jumble sale and setting up an after school gardening club. Together with the Brookfield PTA, we started an after-school gardening club every Friday last year from spring to Autumn. We used the raised beds in the junior playground and the nursery, and also the school plot in the Waterlow Park kitchen garden. We had a huge amount of enthusiam so far from parents and staff who are willing to help out, and the club is over-subscribed. The club will begin again in spring 2013, so if you are the parent or carer of a child at Brookfield and would like to get involved (even if you have never grown food before! ), please let us know at: transitiondp@gmail.com or look out for info in the school newsletter. Holly Lodge family centre have approached us to help create a children’s garden.